The Passaic River Watershed is an interdependent system of water retention, transportation and use formed by nature and adapted to human needs. Water falls in the wilderness regions of the Highlands, flows through aquifers and rivers into reservoirs and wells, and is taken for use by people and industry by the downstream communities of the Lower Valley. But the system can’t be taken for granted! 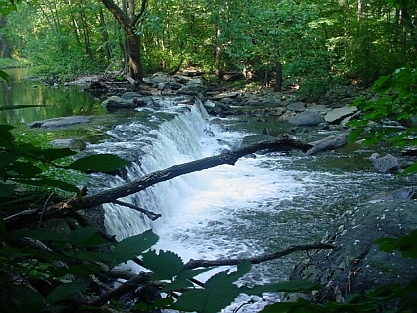 To seek and promote natural solutions for reducing flooding damage in the Passaic River Basin, one of the most flood-prone rivers in the United States. PRC has been the primary agency seeking natural alternatives and cost-effective solutions to reduce flooding conditions. We were instrumental in the creation and passage of the Blue Acres Program in 1995, securing $15 million for the acquisition of residential structures located within floodways, as well as catalyzing the renewal of the program with $12 million as part of the 2007 Garden State Preservation Trust refunding bond act. Getting people out of harm’s way and restoring the floodway to provide natural cleansing functions is a win-win situation. To preserve and restore significant natural areas, to protect the landscape and surrounding waterways, to improve wildlife habitat, and to provide new recreational opportunities for people. In 1993, PRC created a Land Trust to acquire properties of ecological significance and unique landscape character for water resource protection. Preservation of land has become a dynamic part of our daily operations. With a policy of offering fair market value, PRC has acquired nearly 1,000 acres of dedicated open space that will NEVER be developed, an amount that will continue to grow. These parcels will become sites for passive recreation like hiking or birding, outdoor research areas for students and scientists, and places for threatened and endangered species to find sanctuary. Our leadership helped create the Passaic River Restoration Plan, developed in the early 1980s to provide guidance to the urban municipalities along the east bank of the River to restore its riverbank and create a new greenway corridor. Working with the Greenwood Lake Commission, we oversaw the reduction of submerged stumps, leading to more open water and the first sailing regatta in 12 years on the Lake. To preserve and manage surface water supplies that provide high-quality drinking water to 3 million people in northeastern New Jersey. PRC has been involved in the creation of new surface supply systems such as the Monksville Reservoir and the development of three Water Supply Master Plans for New Jersey. PRC has assisted in plans to restore Greenwood Lake, a primary water source for northern New Jersey and is creating the overall restoration guide for the Lake. To improve water quality by eliminating and reducing point and non-point source impacts along the Passaic River, one of the nation’s most polluted rivers in the 1970s. PRC has been involved in countless initiatives to improve water quality in the Passaic River and its tributaries. We have participated in federal and state task forces and project committees such as: Section208 Northeast New Jersey Waste Water Management Planning Committee, NJ Pollutant Discharge Elimination System permitting, New Jersey’s watershed management area (WMA) programs, and the Congressionally sponsored Lower Passaic River Restoration Initiative. This latter program addresses the accumulated pollution from urban areas for over 100 years. It is, perhaps, the greatest challenge of impaired water quality in the United States. To protect the Basin’s groundwater to ensure long-tern high quality for 80% of the drinking water for the region. PRC established the Passaic Valley Ground Water Protection Committee, which obtained federal recognition for the Buried Valley Aquifer Systems and published studies on its contamination and protection. We’ve created a Well-Head Protection Program to keep groundwater hazards out of municipal wells. The next challenge, given the 46 million gallon per day groundwater deficit in the NJ Highlands, is to develop strategies to retain the water that is flowing out of the system today.